Today marks one year since Sea of Thieves first set sail, and to celebrate Rare announced its Anniversary Update, set for an April 30 release date. The update will bring a new competitive mode, story adventures, a new Trading Company, and various world improvements. For those embracing the PvP aspect of the pirate life, the update’s competitive mode – named The Arena – lets players dive straight into the action in a “purely competitive setting”, according to the Sea of Thieves website. No more of that tedious cooperative hurdy gurdying (we’re joking, we love that, too). The second major addition is Tall Tales. These are collections of “story-rich quests” that promise undiscovered areas and “surprising” gameplay features. The first of these collections is called Shores of Gold. The long-awaited ability to fish and cook will also be added in update. 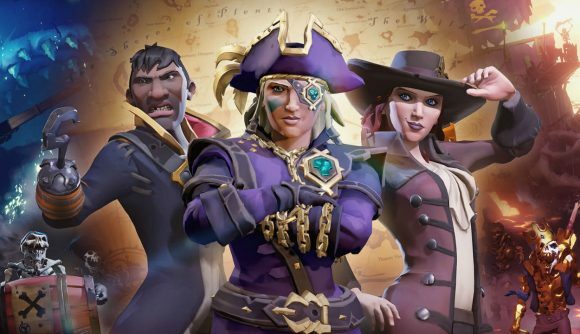 There’s more in the form of a new Trading Company, called The Hunter’s Call, that will exchange your best culinary creations for gold and cosmetic rewards, as well as provide another route to the title of Pirate Legend. Talking of being a legend, sailing while battling is set to require much more skill, as expanded ship damage could result in a broken mast, capstan, and wheel. And the addition of a harpoon will allow players to embrace their inner Jack Sparrow as they attempt “surprising manoeuvers” with the new tool. It’s also capable of stealing enemy treasures, which is handy. New enemies, and the addition of on-land traps, will make Sea of Thieves’ world an even more perilous place to be than usual.